Camel is not only a timeless classic, but totally on trend this season. It’s a neutral that can be worn with many different outfits and always adds a sophisticated edge to a look. Here are 3 popular ways to wear this classy color. #1 Camel and black is a match made in heaven! It always looks chic. Danielle from WEWOREWHAT kicked things up a notch by incorporating leather leggings into the mix. You can't go wrong with leather! #2 Camel paired with stripes always looks like a million bucks. Kat from With Love From Kat incorporated camel into her outfit through accessories. The boots and scarf really pop when paired with black and white. #3 Camel and white looks fresh and modern. I love how Helen from Brooklyn Blonde added a pair of animal print heels into the mix which adds depth and really completes the outfit. Camel is a safe and wise color to invest in. It's always nice to have staple colors like this on hand ,along with black, grey, and white in order to mix and match easily. It's all about building a functional closet and making your wardrobe work for you right?! How would you wear camel? Are you a black and camel kind of gal or are stripes and camel more your style? Let us know in the comments below! We can't wait to hear from you. It's that time of the year when Holiday parties are filling our calendars and the question of "what in the world am I going to wear" is inevitable. Don't worry, we've got you covered! Here are three Holiday looks that are sure to make you sparkle this season. Outfit #1- If you're on a budget and you don't want to spend a ton of money on a new outfit consider purchasing a metallic shirt or accessory. Chances are you already own a pair of black pants and heels, by incorporating a little shimmer into your outfit you're sure to be Holiday party ready in no time! Outfit #2- Dress up your plaid shirt with a leather skirt, a statement necklace, and heels. It's an easy to achieve look that is both edgy and chic. Outfit #3- It wouldn't be a party without sequins! If you don't want to look TOO dressy, pair a sequin skirt with a sweatshirt or t-shirt. Balance the look with a pair of statement earrings and heels. This "Cheers" top from J Crew is perfection. The Holidays are the perfect time to shine. Whether you wear metallics, sequins or glitzy accessories your sure to sparkle this season. The time has finally come to pull out your winter outfits! Here are some celebrity winter styles that we love. Grab inspiration from them as you get into full winter style mode. They show us that it is possible to look cute even when you have to be all bundled up. 1. Emma Stone rocked the perfect casual winter look with skinny jeans, an overcoat, graphic tee, and cashmere beanie. 2. Hailey Baldwin looked adorable and comfy in an oversized cashmere sweater, leather leggings, and a ballet bun. 3. Jessica Alba dressed ready to face the snow wearing skinny jeans, leather knee-high boots, a duffle coat, and furry flying cap. 4. Jessica Chastain looked absolutely stunning in her bright red winter coat and black heels. 5. Katie Holmes combined denim, cashmere, and leather perfectly. 6. Street style queen, Taylor Swift, looked stylish as always in a beige peacoat, plaid scarf, maroon skinnies, and brown lace up boots. Let us know what your favorite celebrity looks are! Every Fall I look forward to the return of pumpkin spice lattes, scented holiday candles, and PLAID SHIRTS. In pursuit of the PERFECT shirt I have searched high and low to round up my top picks for this season’s star wardrobe staple. Here are six shirts I’ve got my eye on. 1. Madewell makes an excellent modern plaid shirt. This color is called "warm berry" and it is perfection. I love the lightweight material and the muted colors. 2. This second Madewell shirt had to be included in the roundup. I love the color combination and the slim fit of this shirt. I'd consider this one a MUST for my Fall and Winter wardrobe this year. 3. Gap's red and black fitted boyfriend shirt is extremely popular and for good reason. The plaid is a staple color combination that will never go out of style. This shirt is ultra soft and has a tailored slim fit to it that is very flattering. 4. J Crew's boyfriend shirt in bluegrass plaid is a bright, happy shirt. I love the comfy, thick material and the relaxed fit. 5. Target has an impressive array of plaid shirts available this year. It's always nice to have a lot of "options" right at your finger tips. A price tag of $22.99 for this shirt is also very appealing! 6. Old Navy is another store that has a ton of shirts to choose from at a lower price point. This poppy, blue plaid is a "fun" color combination to add to your shirt collection! Have you found the perfect plaid shirt yet? Let us know where you scored yours in the comments below! Jogger pants could possibly be Fall's best trend. Why you ask? Because they are both comfortable AND chic! You can curl up in them to watch your favorite movie, hit the gym, run errands, and then magically transform into a glamorous fashionista with a quick change of shoes and accessories. To show just how versatile this trend is I've rounded up three ways to style these pants. 1. The first look has a casual-cool feel about it. A white tee and converse are dressed up with faux leather joggers, a wool coat and black clutch. Want to know the best part about this look? It's ALL from Forever 21! Chic, comfy, and affordable just how we like it, right ladies? 2. The second look features a pair of J Crew joggers paired with a structured blazer, sneakers, and a sporty bag. By day you can run errands in style and by night you can easily swap out the sneakers for heels, the bag for a clutch, add some sparkly accessories et voila your ready for a night on the town! 3. The third look is styled by Mara from M Loves M. It is a dressier way to wear the jogger pant and it is my personal favorite. Anything paired with a moto jacket and heels is a winning outfit in my opinion. Can you believe these pants are from Old Navy?! How would you wear this trend OR would you wear it at all? Let us know in the comments below! Knee-high boots are a must have pair of shoes that every girl should have in her closet. These flattering and stylish boots can complete the perfect outfit, whether you're wearing a pair of cute shorts or a fancy dress. Knee-high boots come in a variety of styles and colors so finding a pair to wear with your favorite winter outfit should be an easy task. Charlotte Russe has a variety of knee-high boots at an affordable price. They have boots with or without heels, different colors and boots with belts and buckles. 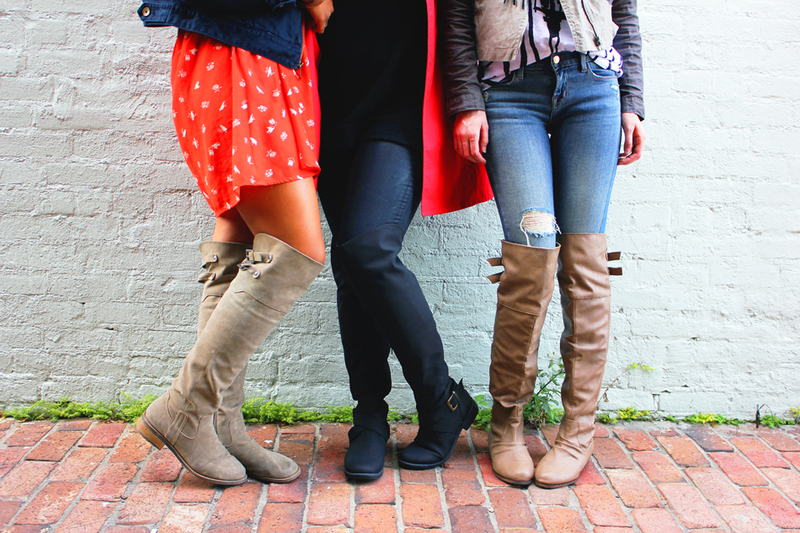 Finding a pair of knee-high boots that fit your personality and style can be easily accomplished at Charlotte Russe. You never know, you may even find a pair on sale! Shoe Dazzle is another great place to purchase some of these trendy shoes. Shoe Dazzle even personalizes shoes for you off of a quick survey based off of your likes and dislikes. The experience of having pairs of shoes picked out for you is fun and easy, and can make shoe shopping enjoyable. Francesca's is a cute boutique that focuses on trendy styles. Wearing knee-high boots is a fashion statement, and Francesca's will help you create that statement with the boots they sell. The whimsical style they present is perfect to finish off that outfit you've been dying to wear. Knee-high boots can be expensive depending on the brand and style, however, there are always sales and stores, like Charlotte Russe, Shoe Dazzle, and Francesca's, where you can find the pair of knee-high boots that will fit your style at an affordable price. Knee-high boots are definitely one item you must have. Moto jackets (a catchy, shortened name for motorcycle jackets) are this fall and winter's go-to staple piece to create that edgy layered look. Today's moto jackets come in a countless variety of colors, patterns, and styles. Whether you're edgy, earthy, or eclectic, you'll have no problem finding one that fancies your taste! You can find them just about anywhere, and they range anywhere from $20-$200 depending on where you look. This piece is a classic fall/winter item, so it's worth the investment to get one that you really love! Chelsea is showcasing her edgy, eccentric flare with this black and white crackle textured moto jacket by Sam Edelman. She paired it with a graphic tee and ripped jeans (another HUGE trend this season). Don't be afraid to mix different textures and patterns! Chelsea is also wearing a two-toned Moto Jacket, another new spin on this cool classic. The neutral tones and natural fabric make this a versatile piece that can go with many outfits. Chelsea purchased this amazing organic linen jacket for more than half off at the Eileen Fisher store! Moto jackets can be worn with just about anything from a feminine printed dress to your favorite old t-shirt! Find one that's the right cut and style for you, and you'll be ready to effortlessly step out in style this fall!